To escape from their busy lives, Fran Hackett ’80 and her husband, Dave, spent time at their home in Diamond Beach, NJ. They made friends there and became active in the community. Mr. Hackett volunteers at the Naval Air Station Museum in nearby Wildwood, NJ and often shows his classic car at local car shows. 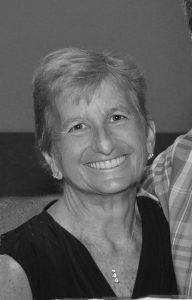 Ms. Hackett was involved in the condominium association prior to her death in June 2015. “We love the community and its residents,” she said, “We have gotten to know many local people and when we go into restaurants and stores, people know us by our first names. “What other way to say thank you to an area where we have felt at home, been welcomed and had such enjoyment than to provide a scholarship opportunity to Ramapo College students from Cape May County,” she added. This is the seventh endowed scholarship established by Fran Hackett ’80 to benefit the students of Ramapo College. This scholarship is not awarded through the application process. Kelli Cortlyn Young-Kravitz of Tuckahoe, N.J. is a Communication Arts major with a concentration in Digital Filmmaking and a Visual Arts minor. She has a 3.48 GPA. She is the first in her family to attend college through the Educational Opportunity Fund (EOF) program, and plans to pursue a Master in Library Science. At Ramapo, Kelli has been active in several organizations and activities, including the Women’s Center as a volunteer and attendant to events, the Ramapo Potter Library as an assistant and student aide, and as a curious learner frequently attends openings for Ramapo’s art exhibitions. She is involved in local Animal Shelter benefits such as the Dinner for the Doggies hosted by the American Rescue Dog, and attendance at local animal shelter events such as the Jersey Shore Animal Center’s Paws and Claws 911. She also volunteers at the Jersey Shore Animal Center located in Brick, N.J.
Megan Verycken of Cape May, NJ is a Music major with a concentration in Music Industry. At Ramapo, Megan has been involved in RCTV, the student run television station, as a general member. She will be studying abroad for the Spring 2017 semester, spending 12 weeks in Paris and London. Megan is passionate about music and plays the guitar, violin, and piano in her spare time. Upon graduation, she plans to pursue a career working for a record label and eventually wants to become a tour manager. Maria Magee is a sophomore from Rio Grande, NJ majoring in Political Science. Madison Gray of Cape May Court House, NJ is a Psychology major and a Criminology minor. She is a member of Sigma Sigma Sigma Sorority and has been active in Leaders in Service and Ramapo Pride. Madison enjoys doing volunteer work with her sorority sisters or exploring her own community service interests. She assists those with disabilities at Pony Power Therapies, a therapeutic horseback riding program. Madison plans to pursue a Ph.D. and to become a criminal profiler/analyst for the FBI or a psychologist who works with prison inmates. “Receiving a scholarship is a step forward in reaching my career goals and a guiding light through all of the struggles I may face,” she said. “It also serves as a reminder to always give back to your community and to believe in others.” Madison has a 3.14 grade point average.